I tend to be just a tad bit religious, and some of my friends don't relate. Thanks to a "Talk of the Town" piece in the May 19, 2014 edition of The New Yorker, an item authored by environmental writer Elizabeth Kolbert, I think I may have discovered a solution for those who are reticent of any involvement with "religion." 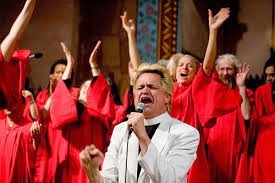 Pictured is Reverend Billy, with his choir. He heads up The Church of Stop Shopping. My thought? We all ought to join that church! Even if you're not religious!